I'm getting ready to head to the Alaska State Fair to watch rides, try desperately to remember names of people I only see once a year ... and to look for plates! Take your price guide. This may be obvious, but it's sometimes hard to tell if an unusual plate is priced reasonably. Bob and Chuck Crisler's License Plate Values is a great general reference, though it only speaks to passenger plates. Check the completed auctions on eBay to get a feel for the pricing of plates you're interested in. Take your collection with you. It's good exercise. :-) OK, not literally, but you should take your lists with you. Don't just take the list of plates that you want (what collectors call their "want list"), but also take a detailed list of what you have. You never know what information you'll need to make a good buying decision. A picture is worth a thousand words. Don't just take a text list of what you have -- take photos, too. If you're not already taking pictures of all of the plate s in your collection, think about doing so. I use Irfanview's "contact sheet" feature to print out a page full of photos of all of the plates in my collection, so that I can instantly tell exactly how good of an upgrade I'm looking for. Plates are priced significantly higher than your idea of their value. If they're selling a single '76 Bear plate for $40 or more, they're trying to gouge people. Lots of the plates are unlabeled and unpriced. Replicas are not marked as such. The seller tries to pressure you into buying right away instead of thinking about it and coming back later. The seller seems to be sizing you up to see how much to charge you. Be ready to walk away. Unless it's a screaming deal or it's before 1950, enough plates change hands at reasonable prices on eBay that you can afford to let a plate go if it's too expensive or if you're not comfortable with the transaction or the seller. 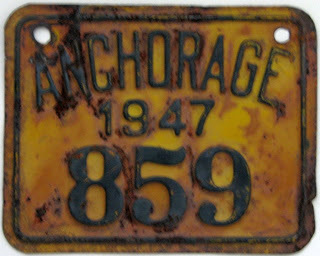 The State of Alaska sometimes assembles their own plates using numbers from retired plates and riveting them to a blank base. Definitely an eye-catcher on the road. According to an article on The Washington Post, D.C. is mounting cameras and plate recognition systems on 200 patrol cars. It will probably be a while before Alaska needs this technology. There's also a shot of Egan's son attaching a #1 Alaska license plate to his motorcycle. Searching for 'car' or 'truck' also yields some interesting results, but I'll leave those as an optional exercise. The Alaska Children's Trust works to prevent child abuse and neglect, and the plate itself is charming with its cute artwork of a fisherman boy in a rain slicker. 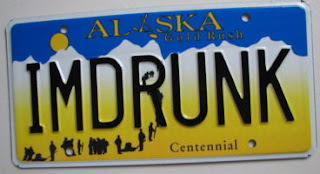 Here are three trivia tidbits about the Alaska Children's Trust plates. 1. 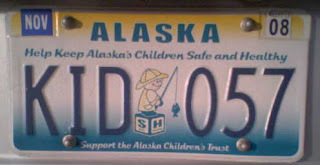 Unlike most Alaskan plates, the KID plates started with KID 001 instead of KID 100. The only other "AAA 999" plates on the road today that do this are the Prisoner of War plates (POW 001) and the Low-Speed Vehicles (LSV 001). Any other plates that you see of the form AAA 001 are either non-current, or vanity plates. 2. You can transfer KID plates from one vehicle to another! Most non-vanity plates aren't portable in this way. 3. A new plate design is in the works. It looks like voting for the new design is over, but I'm still investigating which one won. Update 9:19am: According to my sources, the voting is not over -- it's just on hold, and it will be resuming in the near future. I'll post again when I hear more. 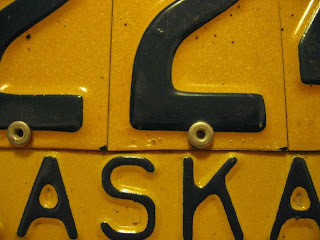 We're having the 2008 Alaska license plate meet on October 4th. This year, the meet is in honor of the late Earl Jenson, a former Alaska State Trooper, collector, and all-around great guy. 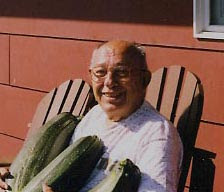 His collection of Alaskan plates was phenomenal. Here's a photo that he sent me when I first contacted him. If you collect Alaskas, you know just how tough some of these are. For example, 3 is the lowest Legislator plate number (1 is the Governor, 2 is the Lt. Governor). When I was just getting started, Earl befriended me and answered many eager questions about Alaska plates. He taught me that being a collector is about more than just acquisitions. He was always willing to encourage new collectors and to share all of the information that he had. We miss you, Earl. I recently got this plate from someone who found it in the newspaper lining of a dresser that they were refinishing! I only have photo evidence of two Anchorage city plates. 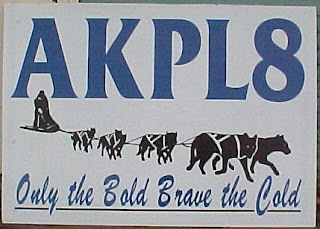 The other (#878) is in the Alaska section of the ALPCA Archives (membership required). A photo of 878 was also in the February 1984 issue of the ALPCA Newsletter. 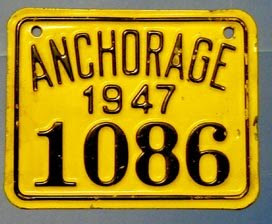 If you have any photos or information about Anchorage City plates from this era, please let me know! The Research department of the Alaska DMV has recently started publishing on their site some driver license statistics (from 1998 through 2007). They are rough scans published as PDF, but the data is there. This could be handy for research purposes as a cross-check of the statistics about issued plates, which Research also makes available at the same location. "COOPER LANDING: On July 18 at approximately 7:40 p.m., Troopers observed a Green pickup towing a white cargo trailer traveling North at Mile 40 of the Sterling Highway. The trailer license plate was a decorative facsimile of an Alaska Centennial license plate, which read “CHICKEN.” Troopers contacted the driver Robert G. Johnson, age 52 of Chugiak. An investigation revealed that there was no record of the license plate and that the trailer had not been properly registered. Johnson was summoned to the Seward court for Improper Evidence of Registration or Title." No investigation was needed to find record of that plate: "CHICKEN" has seven letters, and all Alaskan vanity plates have a maximum of six. A cautionary tale for us all. Via the Turnagain Times. 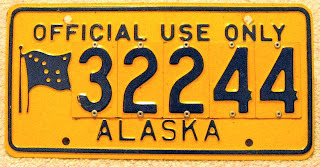 Using non-Roman alphabets for Alaska plates: three points of view. How to use triangulation to determine whether the plate two blocks ahead of you is embossed. Petitioning the DMV to release colors that will benefit license plate mosaics. Report on the Uruguayan effort to make the Golden Ratio an international standard for license plates. Special cleaning fluid for license plates: worth the extra money? New space-saving fractal-based display structures. I just saw an odd plate that I couldn't get a photo of in time. It was on a trailer being pulled by a non-tractor truck that was hauling a load of culvert. The plate was smaller-size, "Official Use Only" across the top, number in the 50000s, entirely flat (non-embossed), with a crest of some kind on the left, and maybe some text on the bottom (I couldn't make it out in time). 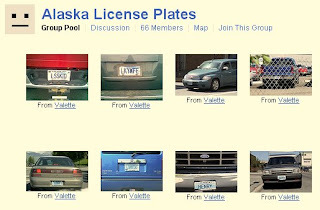 There is a Flickr photo pool of Alaskan license plates. They're almost all vanities, and fun to sift through. (Flickr is a popular photo publishing site, with good free features and some nice premium perks for folks who want a little extra). Robert Woolsey of KCAW Public Radio in Sitka interviews Dean Potter, creator of the art used for the 50th anniversary of Statehood plates. Or you can download the MP3. Via KCAW. There's a new extreme listed on my extremes page. David Helmer has contributed a photo of an Alaskan plate with 18 distinct, non-overlapping stickers - a new record. The DMV has started to issue a Purple Heart vanity plate, which is only available to Purple Heart recipients and only available as a personalized plate. It's not on the Alaska DMV personalized plates request page because you have to provide evidence of your Purple Heart to receive it. Tucked inside today's Anchorage Daily News is the 2008 edition of the magazine that promotes the 2008 Alaska State Fair. This year's cover has a kid's wagon with the new Statehood plate vanity that says "PALMER". Extra points for it being a valid string (six characters or less). 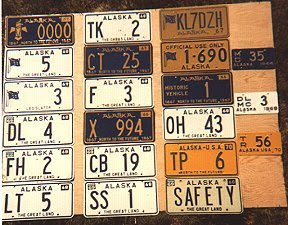 In fact, the Alaska DMV personalized plates request page says that "PALMER" is an actual vanity string that has already been issued. Hopefully, this artwork will not cause any trouble with law enforcement. "Our database says that this plate should be on a 1987 Chevy Cavalier, little boy ..."
The KTUU D2R Construction Map has this fun license plate graphic. Via Colorado collector and Alaska Amateur Radio operator Patrick Cuddihy. Thanks, Patrick!